Before I get started, thank you to those of you who sent your well wishes concerning my 4-year old son. He is doing great with the new glasses, and if I can ever get him to sit still long enough, I’ll be sure to make a custom card of/for him. By the way, his first words after getting the new specs were, “Daddy, I can see where I am going!” Awesome. Alright, I’ve been wanting to do this Name the Game post for a long time now. I have researched this bad-boy for going on six months, well, actually like two hours if you combine all the time spent, but it took me six months to produce this. 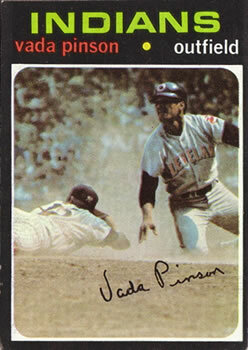 The 1971 Vada Pinson has to be one of my all-time favorite cards. 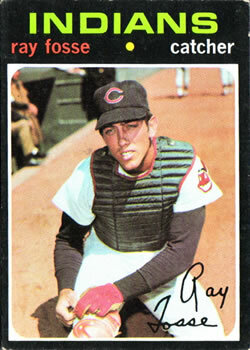 I am surprised that Play at the Plate hasn’t had this card as his header, yet. The card shows a sprawled out Thurman Munson, and Vada Pinson emerging from the home plate dust. Classic card that surprisingly has a huge back story. 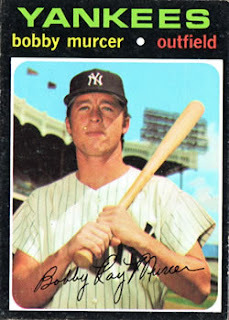 Well, I consulting Baseball Reference and found out that the Indians played at Yankee Stadium nine times during the 1970 season. Of those nine games, one was a night game. Scratch. In another, Thurman Munson did not don the Tools of Ignorance. Scratch. In two more, Vada Pinson never reached base. Double scratch. And finally, in three of those games, Pinson never had a play at the plate. Triple scratch. Four Home Runs – Bobby Murcer hit four consecutive home runs, tying Lou Gehrig. Firecrackers! – A “fan” threw a cherry bomb from the upper deck, where it exploded next to Indians Catcher, Ray Fosse, causing burns through his stirrup, sock and shoe. The fan was arrested, and Fosse played on. 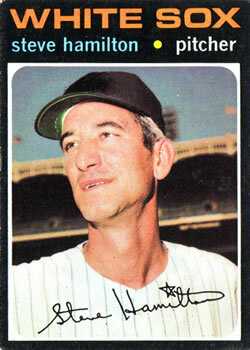 Folly Floater – Yanks pitcher, Steve Hamilton, lobbed a high soft pitch to Tony Horton, who promptly popped it up. Horton called for another one, Hamilton obliged, Horton popped out and then proceeded to crawl back to the dugout on his knees. Fight Night – Pinson tried to score from second on a wild pitch. 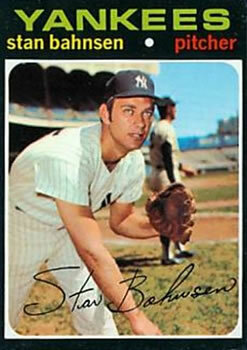 Munson retrieved the ball and threw it to Stan Bahnsen at home. Bahnsen tagged high and hard, prompting a response from Pinson. Bahnsen threw the ball hitting Pinson’s foot, and then Pinson laid Bahnsen out with a single left hook. BAM. 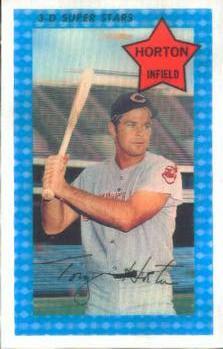 Top of the 8th, Indians Batting, Ahead 6-0, Yankees' Ron Klimkowski intentionally walks Vada Pinson. Ray Fosse singles to CF and Pinson goes to third. Nettles flies to center, and Pinson is thrown out at home on a sac fly. While fruitlessly looking for pictures of The Fight, I found something even more interesting. Turns out there was a 1970s movie called Bang the Drum Slowly (You can read about it on Wrigley Wax). In this movie, they used action footage of the real Yankees. 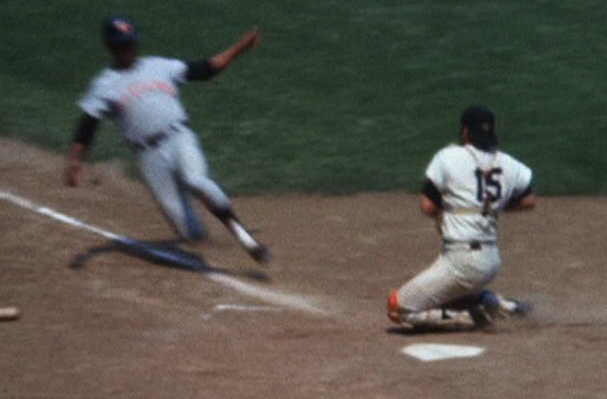 Check out this screen cap from a certain home plate encounter used in the movie. Look familiar? Munson is positioned to catch and tag from a center field throw. Pinson is sliding into home. The moment just before the picture used on Pinson’s 1970 Topps card was taken.